» no.3 Say, lad, have you things to do? Three LPs were originally laid down: 'Songs of Travel', 'A Recital of English Song' and 'The Songs of John Ireland', and they appear here as a double CD. The performances are considered by many to be definitive, and the present collection, re-mastered from the original tapes, appears by kind permission of the SAGA Continuation Trust. The recordings have not been available in CD format for 20 years, which makes this Heritage release highly anticipated. 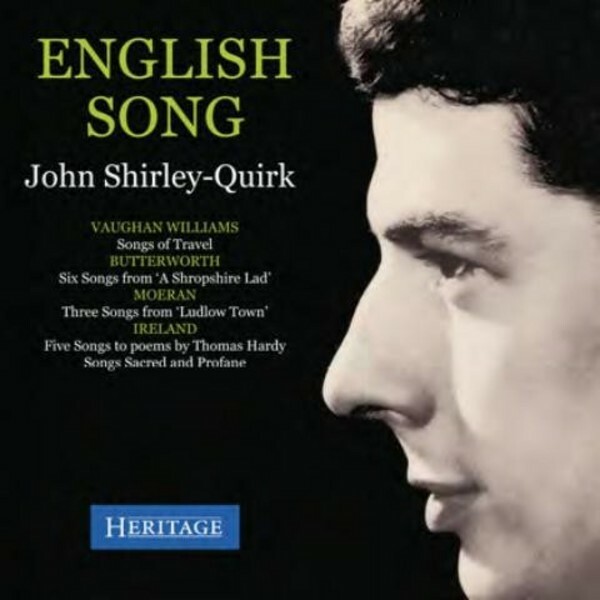 John Stanton Shirley-Quirk CBE (28 August 1931-7 April 2014) was an English bass-baritone who started his working life as a chemistry lecturer before becoming a member of the English Opera Group from 1964 to 1976. His early singing career began as a member of the Purcell Singers and as a lay clerk at St Paul�s Cathedral. He went on to give premiere performances of several operatic and vocal works by Benjamin Britten, recording these and other works under the composer's direction. He sang and recorded a wide range of repertoire by other composers and consequently his discography is huge. His vocal style is characterised by a rich and smooth timbre coupled with a level of musicality which enabled him to interpret the music he was singing with great profundity.